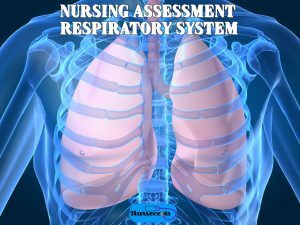 The nursing health assessment is one of the best skills a nurse can possess. This simple skill will help your day go smoother and you can eliminate the preventable surprises in your day. Once you develop a method that you are comfortable with, practice is needed. There are as many different methods as there are students. You need to decide how you want to examine the body and practice that method. Performing the assessment differently every time will not help you become efficient and you will find you always forget something. Once you learn how to move through the assessment you will save time. 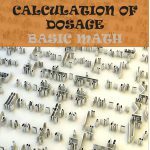 This article will not tell you what you are looking for but more on how to proceed. The article will also give little tips as you perform your assessment. It will tell you how to use the knowledge from your health assessment class and put it to work for you. First, a few tips before you begin. Tips To Increase Speed of Assessment. 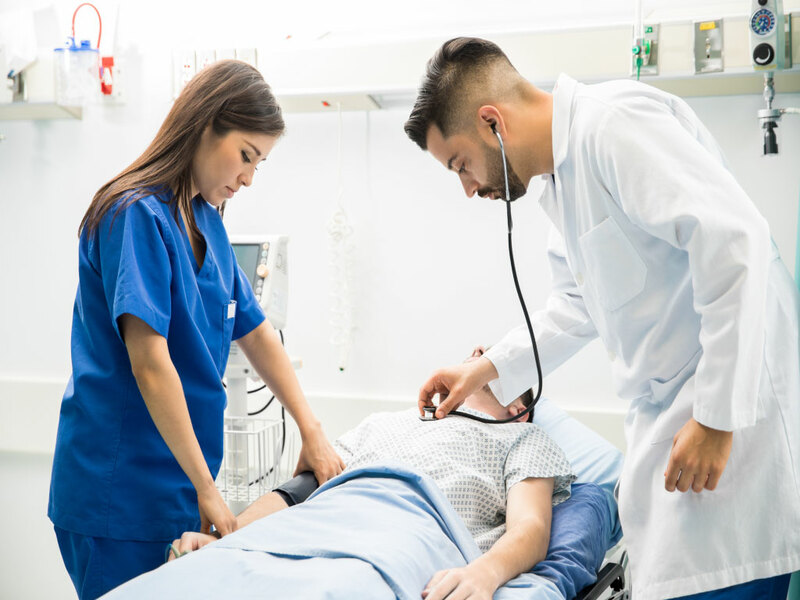 Before you enter your patient’s room make sure and find the diagnosis and read as much of the chart as you can so you will have an expectation of what you will see. The history and physical is a good place to see what disease processes may be present. While moving down the body, remember you are checking general skin condition as you proceed. Check the appearance, color, and temperature as you go. There is no need for a separate skin assessment. Perform a focused skin assessment if the patient has an injury, wound, etc as you move through the assessment. As you move down the body use visualization, palpation, and auscultation. Instead of trying to remember the hundreds of things you could possibly see, what are you actually seeing? Assess equipment, tubes, drains, and dressings etc. as you go. During the assessment of the torso, assess heart sounds, breath sounds and bowel sounds one after the other while you are auscultating. You will not have to spend extra time taking your stethoscope in and out of your ear. Do a more focused assessment on a particular system if there is an injury or disease process affecting it. You don’t have to guess or wonder about certain things. If your patient is able to talk, they are your best resource. This is just an example of one way to assess your patient. The head to toe assessment is a great way to get through an assessment in record time. Divide the assessment into cognition, head, torso (arms), legs (feet), genitourinary, and whole back. Assess everything in that section as you go. Examples of some things to assess in each section are listed below. Check a patient level of consciousness by talking to the patient. As you are talking to the patient ask questions to make sure they are oriented. You can get a lot of information from a patient by asking them why they were admitted. Patients don’t usually mind repeating information if they have a new nurse or student. When your patient is not conscious then perform the steps for a neurovascular check before you continue. This will give you information on how to proceed further. While you are talking to the patient this is the perfect time to look at the facial expression and inside the mouth. When assessing the head, look at skin and hair. Take out your pen light and check pupils and ask your patient question about contacts and cataracts etc. This is a good time to think about assessing oxygenation, especially while you have your penlight out. If a patient has oxygen via nasal cannula, check behind ears for irritation, on the cheek for indentation and in the nose with your pen light for irritation also. When the patient has another form of oxygen delivery check pressure areas as needed. If the patient does not have oxygen on, check the wall to see if there is oxygen tubing. The patient may only use their oxygen at night or just for respiratory treatments. If your patient is conscious ask them if they are using oxygen and when and why. Check the back of the head if your patient is unconsciousness for moisture or matted hair. If your patient is in high Fowler’s with full makeup and perfect curls this step is not necessary. Check the neck as you move down for abnormalities. Next check torso then arms or arms then torso. Doesn’t matter which one is first. Begin by visualizing the entire torso. Then check the heart sound and count the apical pulse. Next, check the breath sounds and count the breaths per minute. Before you remove your stethoscope check the bowel sounds. When assessing the abdomen, what do you see? What do you feel? Are there any tubes, drains or colostomies etc? This is a good time to ask about the patient’s last bowel movement. Move to the arms next. Pick up you patients arm by the hand and elbow. This supports the arm. Just by taking the arm in this way you can check skin, temperature, and range of motion. While holding their hand ask the patient to squeeze your hand to check for strength. While still holding the hand, check turgor and look at the nails. This is a good time to check for an intravenous catheter (IV) placement and assess the site if present. Check date and note if the dressing needs to be changed or if the IV needs to be changed during your shift. When your patient has an IV ask yourself the following questions. How many bags of fluid are hanging and what are they? (Note: Just because there is more than one bag hanging on the IV pole does not mean they are all running at this time. Pick up the patient’s leg by the knee joint and ankle joint. Ask the patient first. Ask the patient about mobility and check the range of motion. 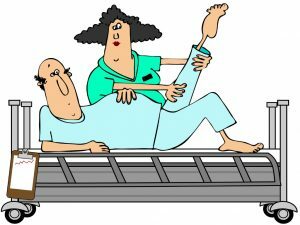 A patient may have arthritis or is stiff. Check the skin on the patient’s leg and feet. Give special consideration if the patient is diabetic. Visualize the heel of the feet for signs of pressure. If a Foley catheter is present, check tubing and urine for color and clarity. Check for irritation from the tubing. If there is no Foley catheter, ask the patient about voiding. 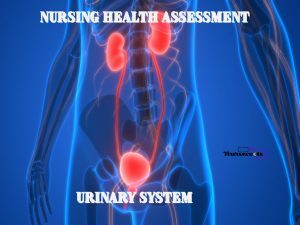 Chart the color and clarity when you actually visualize the urine. The only thing you really need to check on the back is the skin and breath sounds. 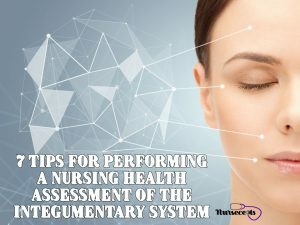 These tips can help you move through a nursing health assessment easily and quickly. Being thorough in each section will help ensure nothing is forgotten. Adjust your assessment so it makes sense to you and you will be able to perfect your method of assessing a patient. Repetition is good. Therefore practice, practice, practice is necessary.